ANGELA KEY, Born January 17th in Blantyre, Malawi. Angela Key Moves to South Africa. The Cape's magnificent fauna & flora provide fertile ground for the young artist. Early drawings depict carefully observed plants, birds & animals in oil pastels. Angela wins the Santam Exhibition Youth Art Award. Her father's career in marketing takes the family from Cape Town to Connecticut, Dallas & finally Johannesburg where Angela matriculates at Northcliff High School. Devoted naturalists, the family make annual trips to game reserves where Angela actively pursues her passion for wildlife. Studies Fine Arts at Wits Technikon, obtaining a distinction in sculpture, before joining an advertising agency in Cape Town as a copywriter. Begins to experiment with bird studies in ink and watercolour. Travels to Kenya, the United Kingdom, Turkey & Eastern Europe before returning to South Africa in 1994. Meets Hennie Niemann Jr. and is exposed to Vermont's illustrious art community who encourage Angela to pursue her detailed bird illustrations in pastel. Sets up a permanent studio with Hennie Niemann Jr. in Vermont, from where she can draw inspiration from the unique and diverse birdlife of the area's mountain and coastal fynbos biomes. Sell-out exhibition with Hennie Niemann Jr. at Onrus Gallery in September. Exhibition at the Cherie de Villiers Fine Art Gallery, Rosebank, Johannesburg. 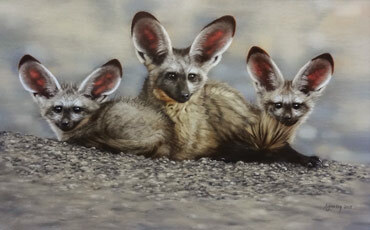 Donates work for World Wildlife Fund’s annual art auction in Pretoria in October. 'New Generation Artists' 4-person exhibition at the Marine Hotel, Hermanus in April. Exhibition for Birdlife SA at International Ornithological Congress, Durban in August. Sotheby's 'Wildlife in Art' Auction, Sussex, United Kingdom. 'Triptych' Exhibition with Hennie Niemann Jr. & Wehrner Lemmer opened by Dr. Anthony Hall-Martin at Johans Borman Fine Art Gallery, Cape Town where Angela’s work was sold out on opening night. Participates in group exhibitions at various galleries around the country; including Stellenosch Art Gallery, 'Art&Wine' Gallery in Clarens, 'Africa Art Gallery' Umhlanga Rocks, The Mission House Gallery in Onrus and Johans Borman Fine Art in Cape Town. Begins experimenting with oil on canvas. Commissioned to illustrate "Stargazing from Game Reserves in Southern Africa' for Struik. Invited to participate in prestigious Wildlands Art for Conservation Auction in Natal and sells-out on adjoining exhibition. Works on various private and corporate commissions including large-scale painting of Manchurian Cranes for LG headquarters in Singapore. Commissioned to illustrate Struik’s Astronomy Guide ‘Stargazing from Game Reserves in South Africa’ as well as educational children’s book ‘Mystery of the Missing Spots’. Angela continues to focus on raising awareness and funds for conservation projects. In 2010, her painting ‘Surf Report’ helped BirdLife raise almost R30 000 to protect the endangered African Penguin. Angela has perfected a pastel technique to imitate feathers and fur, rendering the rich textures, colours and forms of animals and birds with tireless precision. Her handling of light accentuates the 3-dimensional quality of her subjects. Background elements are more spontaneously executed, hinting at natural habitats, but never sterile or detracting from her revered subjects. Angela makes annual trips to remote wilderness areas and is a dedicated conservationist. Her work is represented in many private collections throughout Southern Africa as well as the United States, Canada, the United Kingdom, Germany, Holland & Singapore.